Bollywood actress and former Miss India International Esha Gupta was slammed for her racially-charged comment on Nigerian Arsenal star Alex Iwobi and her subsequent tone-deaf apology. The actress was a part of a conversation that was disparaging and derogatory toward the Nigerian footballer. She had posted a screengrab of the racially-charged chat as a part of her Instagram story, but deleted it hastily when she was called out for being racist. 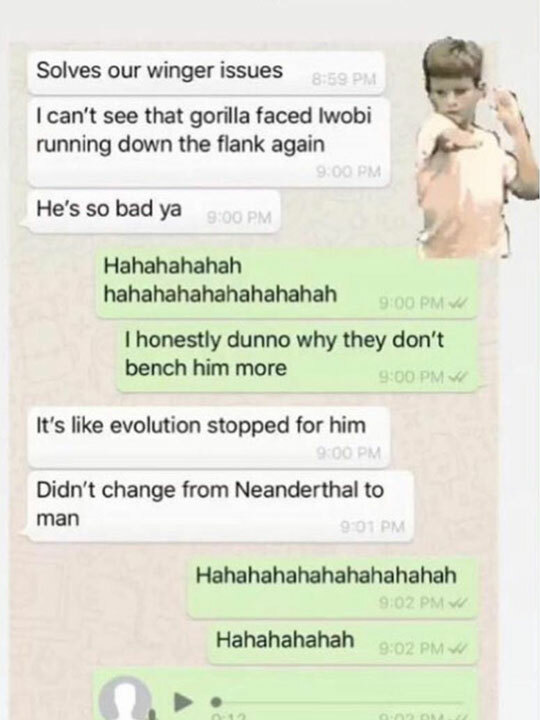 Trouble began when the English Premier League Club ambassador, 33, participated in a chat with a friend, who reffered to the footballer as “that gorilla-faced Iwobi running down the flank again”. She endorsed his remark with a laugh "hahahahahaha". While Gupta was quick to take down the post, screenshots of it were already captured by the fans of the club who who have called for the club to disassociate themselves with her and ban her from attending future matches. Her apology which read: “Guys m sorry you thought it was racist. Was bad on my part, being a sports lover. Wallah never meant it. Sorry guys forgive the stupidity 🙏🏽 #gooner4life (sic)” didn’t satisfy an army of enraged football fans and she was accused of trying to shift the blame. “It was us discussing our frustration during the game.sorry as I din realise it directed towards racism.laughed over the spur of the moment, which was the games result guys.been victim of racism myself before. But this is not something m proud of. It was a fault,sorry guys (sic),” she tweeted. But her series of apologetic posts have not satisfied as calls for her ban on matches escalate. The actress has also been accused of blocking social media users who aren’t buying her apology. Arsenal are yet to comment on the matter.